Raising kids and puppies. They’re always throwing you curveballs and creating bills to pay. 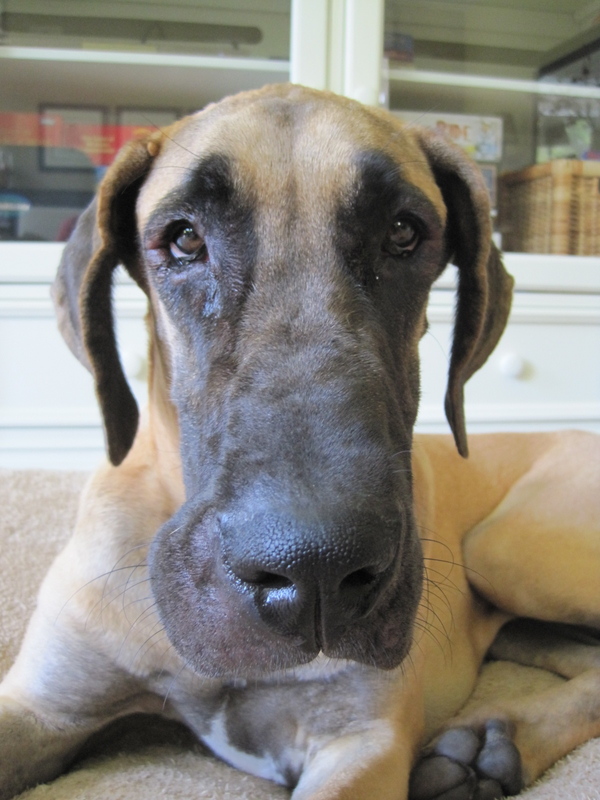 Friday, our Great Dane puppy Luna took on a wasp. The wasp won. The silver medal for Luna was a 7-hour stay at TGV’s, tethered to an IV drip. Surviving the contest cost her family (us) $227. This is how we discovered that Luna is allergic (deathly so, it seems) to insect stings. Friday midday, MW was outside gardening. Luna disappeared behind OD’s playhouse (which is leaving soon because playhouses don’t fit the offline social profiles of 13-year-old girls). Luna came out, started rubbing her face and sat down to snack on some grass. The frothing started. The vomit shortly followed. Her lip quickly inflated so MW brought her inside. She laid down on her bed. Hives appeared. I took this picture. Her eyelids expanded. The top of her head pebbled as a field of hives arose beneath her fur. We decided she needed medical attention. Off to TGV. In the vet’s office, Luna promptly had a convulsion, whereupon the vet tech rushed her to the “back.” As MW quickly learned, the back is the vet’s ICU section. It is where sick and infirm dogs are taken to either die, or recover from serious threats to their lives. Luna wasn’t in full-blown anaphylactic shock, but her approximate version met the definition for the latter. For 30 min., MW paced outside. Finally, the vet came out to announce that Luna had received injections of steroids and Benadryl, and was recovering with a saline IV. When MW left shortly thereafter, just one hour had passed from the time Luna had been stung. MW’s gift for situational analysis has made her psyche the past 72 hours a mix of East-Coast neurotic and survivalist paranoia. Her great new concern is inventorying our options should this event recur and we’re no longer a convenient seven-minute drive from our friendly local vet. Perhaps we’re on a hike, a mile from the trailhead, and 30 miles from the nearest town. What if the local vet isn’t open? What can we give Luna then for symptoms that are certainly going to be much more acute than they were when Luna arrived at the clinic about 20 minutes after her wasp encounter? What if we’re just at home on a Sunday morning? Well, our clinic is closed on Sundays. The nearest emergency facility is 35-40 minutes away. MW’s not happy juggling any of these DEFCON end-of-the-world scenarios. MW’s hope is to find a source for a veterinary version of an Epi-pen. 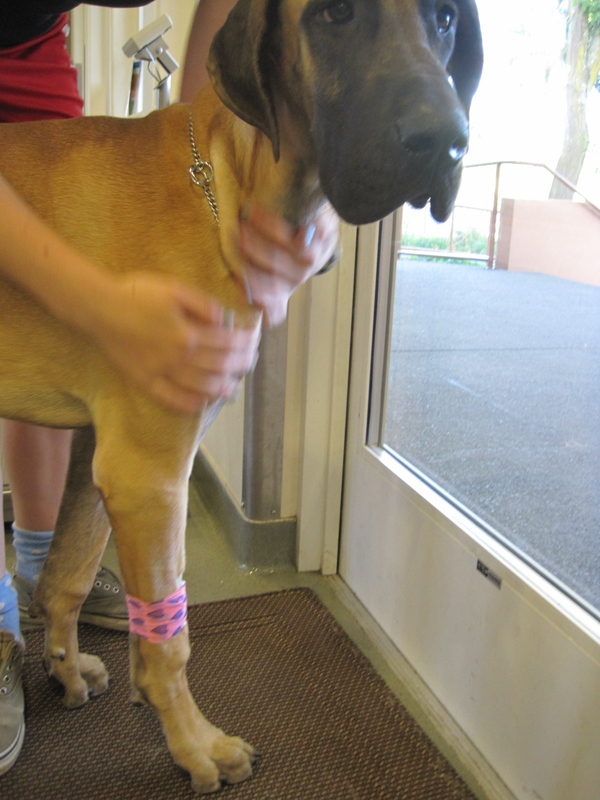 She inquired about this option when we returned at 7:00 pm to pick up a sleepy and tired puppy, sporting a pink wrapping on the shaved area of her leg that had anchored the IV tube. The vet tech didn’t know if they were available. We figured we’d put all of the Armageddon scenarios on the table so we also asked her advice on getting a rattlesnake vaccination. According to her, two dogs were bitten last year at the idyllic dog park that I often describe. (This has cast a bit of a pall over my off-trail running plans there this summer). MW asked for a Benadryl syringe to take home. She was turned down. “We don’t give needles to clients.” I’m sure we could find a methadone needle source in our town if we tried. Instead, we got 100 high-dosage Benadryl pills and instructions to immediately give her three if she’s bitten again, and pray that traffic is light on the roads. Luna returned home to a temporarily wasp-less garden, the result of MW’s eradication efforts during Luna’s afternoon recovery. MW says wasps are territorial and return like migratory birds to the same place every year. We’ll probably have to visit Costco next March and buy insect spray in bulk. MW’s now worried about taking Luna anywhere outside our house and garden. Camping? You must be mad. The beach? Are you nuts? Picnic sites we’ve previously visited? Yellow jacket city. Unless my spouse changes her mind, this portends a kind of hermetically sealed solitude for a puppy who likes nothing more than to loll outside and cloud burst. While the original Boy in the Plastic Bubble story ended tragically, we’re confident of avoiding that by discovering an Epi-pen source. Email us if you know of one. Thanks. Glad to hear Luna is OK and thanks for sharing. I will make sure we put out extra wasp traps so Cassandra does not get into trouble. This scenario sounds like an episode I had about 20 years ago where I got bit by a yellow jacket on the back of my knee. By the next day (at work) my leg had swollen so large from the top of my theigh to the tip of my toes. I had ridden my bike into work so I had to borrow a colleague’s car to get to the doctors. I don’t remember if I had the IV treatment but I do remember the steriod shot and the antihistimines. The bite point blistered so badly that they classified it as a 2nd degree burn. Ouch! Now that I know my Cassie is just as suceptible as I am, I best get on the ball and make sure we both have a means to a viable treatment.